The field of psychology is founded upon concepts – from ‘memory’ and ‘perception’ to ‘depression’ and ‘wellbeing’. Its central task is to define these, tease apart their dynamics, and assess how they manifest in people’s lives. Given that, a significant thought arises: the field is inextricably shaped by the language in which it is conducted. This mainly means English, the dominant language of journals and conferences. As a result, the concepts that comprise the field – its nomological network – are generally those that happen to exist in English. But what of concepts that lack an exact equivalent in our own tongue? Do they reveal phenomena which have been overlooked or underappreciated in psychology? I have been collecting such words, and specifically ones relating to wellbeing (being a researcher in positive psychology). The result is an evolving ‘positive lexicography’, as I explore in two new books – Translating Happiness, an academic analysis published by the MIT Press, and The Happiness Dictionary, a general interest exploration of key words published by Piatkus. Here, I consider five words that have been assimilated into English and helped to shape the field, or that are beginning to make their mark. My hope is that these and other terms, perhaps words I am yet to learn myself, will prove to be useful in a lexicography which enriches our understanding of the mind. Let’s begin with one of the most well known yet also unusual examples, ego. The Latin word for I has been thoroughly assimilated into the psychological lexicon, and indeed English more broadly. Freud himself used German terms for his tripartite theory of the ego, id and superego, namely Ich (‘I’ in German), Es (‘it’), and Über-Ich (‘over-I’) respectively. However, his translator, James Strachey, turned to Latin, perhaps aiming to confer greater scientific legitimacy upon the theory. As a result, ego has become a richly complex term, laden with meaning and significance, when there had been no English equivalent. From one perspective, English is a German dialect, brought to our shores in the fifth century ce by conquering Germanic tribes. It has continued to furnish us with loanwords, many of which then take on special meanings in psychology. A prime example is Gestalt. Originally this just meant ‘form’ or ‘shape’. But then, in the 19th century, it was deployed by Christian von Ehrenfels to describe the overall configuration of something. It moreover came to imply that the whole is ‘other’ – and possibly ‘greater’ – than the sum of its parts. He gave the example of a melody: this is not merely a succession of individual notes, but an entity unto itself. Since then, the term has proved influential, leading to Gestalt theories and processes in disciplines ranging from perception to psychotherapy. This Pāli term for skilful attentiveness is the basis for the construct of mindfulness, which has achieved near ubiquity over recent years. But should we stick to the original term? Critics have argued that ‘mindfulness’ does not fully capture the spirit of sati, being rather cerebral, and lacking its warm, compassionate affective qualities. Moreover, the term mindfulness is often operationalised and harnessed in a secular way, ‘decontextualised’ from its original Buddhist roots. As a result, it is frequently denuded of the ethical and spiritual undertones that gave sati such depth and power. In that respect, in its English rendering, as Kabat-Zinn himself has pointed out, there is a risk of valuable ideas and lessons getting lost in translation. This word has a special significance for me, being the catalyst for the lexicography itself. It was after I stumbled across a presentation on sisu by Emilia Lahti that I decided to start my collection of words. Lahti suggested that although sisu shares conceptual similarity with terms like resilience and grit, it is not synonymous. Rather, it conveys a form of extraordinary inner determination and courage, particularly in the face of extreme adversity and/or challenges which appear to exceed our capacities. Crucially though – for the purposes of my project – while it is celebrated as a nation-defining resource that has enabled Finland and its people to survive and thrive in the face of adversity, Lahti argues that sisu does not only belong to Finns, even if they had the foresight to create the term. It’s a human quality we may all ideally tap into. Indeed, her work is aimed at helping people to do just that. As such, it exemplifies the potential that may be waiting to be tapped in the myriad other words found in the lexicography. Users of social media may have seen an intriguing petal-like image pop up in their timeline. It has four overlapping circles, arranged in a cross formation like a complex Venn diagram. These circles represent, respectively, ‘what you love’, ‘what the world needs’, ‘what you can be paid for’, and ‘what you are good at’. Their intersections signify: your mission (you love it, and it’s needed); your vocation (it’s needed, and pays); your profession (you’re paid, and good at it); and your passion (you’re good at it and love it). 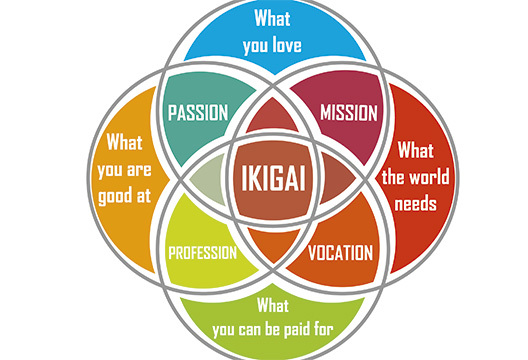 At the very centre, the bullseye, is a Japanese word: ikigai. Explained as having a ‘reason to live’, the term has come to attention through the work of people like Dan Buettner, with his work on ‘blue zones’. These are places whose inhabitants enjoy healthier and longer lives than peers elsewhere, including Okinawa in Japan. Buettner suggests that longevity in these places is due to a combination of factors, including a mostly vegetarian diet, moderate regular physical activity, and… ikigai. This quality is specifically recognised and celebrated in Japan, hence its inclusion in the figure. However, Buettner contends that ikigai is common across all blue zones, even if the inhabitants do not have a specific word for it. In that sense, maybe we could all do with searching for more ikigai in our lives. …and five more, as an online extra! Of all the influences on our lexicon, perhaps the greatest is French. Of the 41 per cent of English words that are estimated to have originated abroad, a quarter hail from France, legacy of the Norman invasion. A case in point is depression, which entered English in the 14th Century (although ultimately derives from the Latin deprimere, meaning ‘to press down’). Originally used in astronomy, by the 15th century it took on meanings of dejection and ‘depression of spirits’. But its use as a clinical term did not really occur until 1856, when the French psychiatrist Louis Delasiauve began using it in place of the more prevalent ‘melancholy’ (itself of Greek origin). The latter initially continued to be more common, as per Freud’s 1914 work Mourning and Melancholia. However, through the work of clinicians such as Emil Kraeplin – who by the turn of the century was using the overarching label ‘depressive states’ – depression gradually became the nomenclature of choice for clinically significant states of dysphoria. The profound conceptual ingenuity of Greek philosophers has meant that their language has furnished the field with many of its foundational concepts, not least psychology itself. And it is the gift that keeps on giving. Consider the recent embrace of eudaimonia. This is celebrated in fields like positive psychology as one of two main types of wellbeing, alongside hedonic pleasure. Indeed, this very distinction dates back to thinkers like Aristotle, who strongly disparaged the latter. Instead, he encouraged the cultivation of qualitatively deeper and richer states of contentment, which he referred to as eudaimonia. In literal terms, this describes the presence of a benevolent (eu) spirit (daimon), reflecting the prevalent mythological worldview of the time, whereby to enjoy health and happiness was to be favoured by the Gods. However, in the hands of Aristotle and others, eudaimonia came to denote an enviable and morally worth state of flourishing, one attainable through the disciplined pursuit of virtue. And we are still drawing inspiration from this conception today, over two millennia later. This next term is intriguing, as not only is starting to draw international attention, but it is already a significant concept in Japanese therapeutic contexts. This reminds us that the field of psychology is not synonymous with Western, English-speaking psychology. There are local arenas of scholarship – sometimes referred to as ‘ethnopsychologies’ – in which terms from the lexicography are already being studied and harnessed. In this case, shinrin-yoku, which translates as ‘forest bathing’, denotes the therapuetic benefits of ‘soaking up’ – literally and/or metaphorically – the tranquillity of natural environments. Of course, the value of nature in that regard is acknowledged in the West, as reflected in the emergence of ecopsychology, and in the work of scholars like of Wil Gesler, with his ideas around ‘therapeutic landscapes’ and ‘healing places’. But shinrin-yoku has been widely recognised and harnessed in Japanese clinical contexts as a specific form of ‘nature medicine’ for physical and psychological ailments. It is a good example of a psychological practice developed in a non-Western context from which the field more broadly might learn. Although wellbeing is commonly associated with subjectively pleasant emotions, it can also involve more ambivalent feelings. However, such feelings can be difficult to appreciate. Indeed, Western cultures are often seen as having particular difficulty in that respect, at least compared to Eastern cultures, which are regarded as more attuned to dialectical phenomena. But dialectical insights can be found in across cultures. German, for instance, has an especially rich lexicon relating to longing, a supremely ambivalent state defined as ‘a blend of the primary emotions of happiness and sadness’. This includes Sehnsucht. Often translated as ‘life longings’, it implies a predisposition towards yearning generally. The concept is notable in that – unlike most others in my lexicography – it has been explored through factor analysis. It was found to comprise six components: a utopian notion of personal development; a sense of life’s imperfection; a blended focus on past, present, and future; ambivalent, bittersweet emotions; a tendency towards deep reflectiveness; and a mental life imbued with symbolic richness. It will now be intriguing to see the extent to which the concept and its factor structure translate to other cultural contexts. We saw above that psychology has benefited greatly from engaging with the concept and practice of sati. However, I also suggested that in being operationalised as mindfulness, this risks denuding it of some of the elements that make it so potent, such as its warm affective qualities. However, the field is starting to address these issues of ‘decontextualisation’. For instance, Buddhist teachings emphasise the importance of sati being imbued with a quality of mettā, a term usually rendered as ‘loving-kindness.’ Meditators can often struggle to infuse sati with mettā in this way, possibly reflecting a more general difficulty people have with the cultivation of (self)-compassion. As a result, a practice has been developed to help engender mettā, known as the mettā bhāvana in Pāli (with bhāvana meaning cultivation or development). And, like sati before it, this is beginning to be operationalised, studied and harnessed within Western psychological contexts as ‘loving kindness meditation’ (LKM). While research in this area is in its infancy, LKM has been found to be beneficial to wellbeing in both clinical and non-clinical contexts. - Dr Tim Lomas is a lecturer in positive psychology, at the University of East London. Read more in our archive. Andrews, L. W. (2010). Encyclopaedia of Depression. California: Greenwood. Buettner, D. (2012). The blue zones: 9 lessons for living longer from the people who've lived the longest. New York: National Geographic Books. Ehrenfels, C. v. (1890/1988). On Gestalt Qualities (B. Smith, Trans.). Munich: Philosphia Verlag. Fredrickson, B. L., Cohn, M. A., Coffey, K. A., Pek, J., & Finkel, S. M. (2008). Open hearts build lives: Positive emotions, induced through loving-kindness meditation, build consequential personal resources. Journal of Personality and Social Psychology, 95(5), 1045-1062. Freud, S. (1914/1957). Mourning and melancholia. In R. Frankiel (Ed. ), (pp. 38-51). New York: New York University Press. Freud, S. (1949). The Ego and the Id. S.E., 19 (J. Strachey, Trans.). London: Hogarth Press. Gesler, W.M. (2003). Healing Places. (Oxford: Rowman and Littlefield Publishers, Inc.). O. Holm, E. Greaker, and A. Strömberg, "Experiences of Longing in Norwegian and Swedish 4- and 5-year-old Children." The Journal of Psychology 136, no. 6 (2002): 608-612, 608. Johnson, D. P., Penn, D. L., Fredrickson, B. L., Meyer, P. S., Kring, A. M., & Brantley, M. (2009). Loving-kindness meditation to enhance recovery from negative symptoms of schizophrenia. Journal of Clinical Psychology, 65(5), 499-509. Kraepelin, E. (1899/1921). Manic-depressive Insanity and Paranoia. Edinburgh: E&S Livingstone. Lahti, E. (2013). Above and beyond perseverance: An exploration of sisu. (MSc), University of Pennsylvania. Likierman, M. (1990). "Translation in transition": Some issues surrounding the Strachey translation of Freud's works. International review of psycho-analysis, 17(1), 115-120. Lillard, A. (1998). Ethnopsychologies: cultural variations in theories of mind. Psychological Bulletin, 123(1), 3-32. Lomas, T., Cartwright, T., Edginton, T., & Ridge, D. (2015). A qualitative analysis of experiential challenges associated with meditation practice. Mindfulness, 6(4), 848-860. Lomas, T. (2016). Towards a positive cross-cultural lexicography: Enriching our emotional landscape through 216 ‘untranslatable’ words pertaining to wellbeing. The Journal of Positive Psychology, 11(5), 546-558. Please see www.drtimlomas.com/lexicography for the current list. Lomas, T. (2017). Recontextualising mindfulness: Theravada Buddhist perspectives on the ethical and spiritual dimensions of awareness. Psychology of Religion and Spirituality, Vol 9(2), 209-219. Lomas, T. (2018). The quiet virtues of sadness: A selective theoretical and interpretative appreciation of its potential contribution to wellbeing. New Ideas in Psychology, 49, 18-26. McMahon, D. M. (2006). Happiness: A history. New York, NY: Atlantic Monthly Press. Monteiro, L., Musten, R. F., & Compson, J. (2015). Traditional and contemporary mindfulness: Finding the middle path in the tangle of concerns. Mindfulness, 6(1), 1-13. Neff, K. D. (2003). Self-compassion: An alternative conceptualization of a healthy attitude toward oneself. Self and Identity, 2(2), 85-101. Palmer, S. E. (1990). Modern theories of Gestalt perception. Mind & language, 5(4), 289-323. B.J. Park, Y. Tsunetsugu, T. Kasetani, T. Kagawa, and Y. Miyazaki, "The Physiological Effects of Shinrin-Yoku (Taking in the Forest Atmosphere or Forest Bathing): Evidence from Field Experiments in 24 Forests Across Japan." Environmental health and preventive medicine 15, no. 1 (2010): 18-26. Perls, F. (1969). Gestalt Therapy. New York: Bantam Books. Roszak, T. E., Gomes, M. E., & Kanner, A. D. (1995). Ecopsychology: Restoring the earth, healing the mind. New York: Sierra Club Books. Ryff, C. D. (1989). Happiness is everything, or is it? Explorations on the meaning of psychological well-being. Journal of Personality and Social Psychology, 57(6), 1069-1081. S. Scheibe, A.M. Freund, and P.B. Baltes, "Toward a Developmental Psychology of Sehnsucht (Life Longings): The Optimal (Utopian) Life." Developmental Psychology 43, no. 3 (2007): 778-795, 779. S.L. Shapiro, L.E. Carlson, J.A. Astin and B. Freedman, ‘Mechanisms of mindfulness’. Journal of Clinical Psychology 62, no. 3 (2006): 373–386. Sinkkonen, J. (2013). The land of sauna, sisu, and Sibelius – An attempt at a psychological portrait of Finland. International Journal of Applied Psychoanalytic Studies, 10(1), 49-52. Tadmor, U. (2009). Loanwords in the world’s languages: Findings and results. In M. Haspelmath & U. Tadmor (Eds. ), Loanwords in the world’s languages: A comparative handbook (pp. 55-75). Berlin: De Gruyter Martin. T.W. Rhys Davids, Dialogues of the Buddha, Vol. 2 (London: Henry Frowde, 1910). Van Gordon, W., Shonin, E., Griffiths, M., & Singh, N. (2015). There is only one mindfulness: Why science and Buddhism need to work together. Mindfulness, 6(1), 49-56. Williams, J. M. G., & Kabat-Zinn, J. (2011). Mindfulness: Diverse perspectives on its meaning, origins, and multiple applications at the intersection of science and dharma. Contemporary Buddhism, 12(01), 1-18.